Alaska’s four-legged athletes love to run and accessing Alaska’s state sport—dog mushing—has never been easier. From 30-minute jaunts to half-day mushing schools to epic overnight journeys—local mushers offer a variety of adventures. Being a spectator at one of the races Fairbanks hosts is also an exciting activity—check out our event calendar for winter race schedules. In the summertime, visits to working kennels and even hiking with huskies are great ways to experience some puppy love. Realize your dream of dashing through the snow on a sled pulled by a team of dogs on a 1-hour, half-day or multi-day mushing tour. Whether riding in the basket or driving your own sled, you’ll appreciate the instinctive power of these amazing animals. Learn about the tradition of dog mushing in the Arctic, while you experience the excitement of the sport first hand. 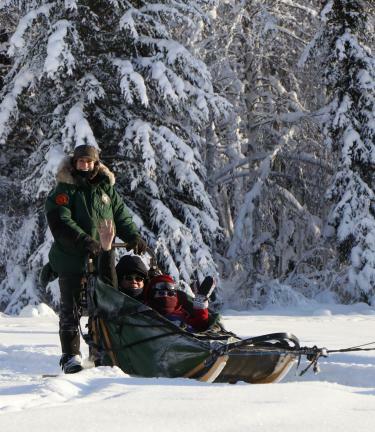 These authentic, interactive mushing tours offer marvelous views of the Alaskan wilderness. Learn how to harness and hook up the dogs at a mushing school, then lead the team on an unforgettable run through miles of trails. Throughout Aurora Season, take in the awe-inspiring Alaska sky at night on a mushing and northern lights combination tour. During "low or no-snow" times of year, kennels use wheeled vehicles for mushing instead. If it’s spectating you prefer, Fairbanks hosts multiple sled dog races during the winter months where competitive long-distance and sprint events continue to delight dog aficionados and race fans alike. 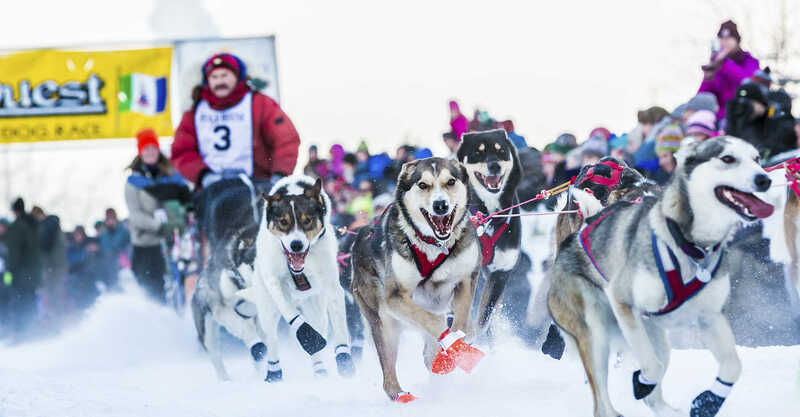 The Yukon Quest International Sled Dog Race, Fairbanks’ most famous long-haul race, takes place in February and the Open North American Championship Sled Dog Race also known as the “granddaddy of all sprint races” is held every year in March. Begun in 1946, the Open North American is Alaska&apos;s oldest sled dog race and entails two 20-mile races and then a third, more demanding 30-mile race. You can get a little closer to the action with a visit to a local sled dog kennel. Joining a kennel tour is a great way to get acquainted with beautiful sled dogs, meet a veteran musher, hear captivating tales and ask all of the questions you may have about the fascinating sport of dog mushing. Under the light of the midnight sun, you can burn some calories while taking a hike with a husky through the boreal forests. Alaska sled dogs will champion the trail and win your heart. By combining “man’s best friend” with a skinless kayak frame on runners, Alaska Natives established the practical use of dog sleds centuries before explorers, prospectors and missionaries made mushing their mode of winter transportation. Historically speaking human emigrants from Siberia that came across the Bering land bridge into North America likely had dogs in their company. 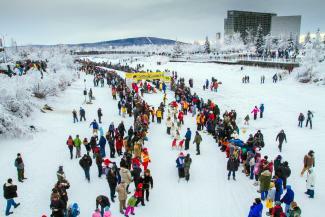 Over the years dog mushing has flourished and the Fairbanks region has become a dog mushing mecca. Sled dogs love to run and with more than 30 different tours available, you can join them on their next journey through some of the last pristine wilderness remaining in North America. An epic 1,000-mile marathon between Whitehorse, Yukon Territory, Canada and Fairbanks, Alaska, the Quest runs through some of the most pristine wilderness in the world, alternating between Fairbanks starts on even years and Whitehorse starts on odd years. The Quest got its start in 1983 at the Bull&apos;s Eye Saloon in Fairbanks, where four mushers conjured up a hypothetical new sled dog race that eventually became the tougher-than-nails Yukon Quest. Named to commemorate the mighty Yukon River, the race also follows the historical gold rush and mail delivery routes that started in the Klondike in the early 1900s. The first Yukon Quest in 1984 saw 26 teams leave Fairbanks and over 16 days later 20 teams had arrived in Whitehorse, Yukon Territory, Canada. Sonny Lindner was the first Yukon Quest champion, completing the race in just over 12 days. Currently, between 20 and 50 dog teams consisting of one human "musher" and up to 14 canine athletes compete in the race. The Quest lasts nine to 14 days depending on weather, trail conditions and the strength of the dog teams.